But one hotel doesn’t fit all. And sometimes, where you lay your head for the night is about so much more - it can be a memorable part of the whole experience. 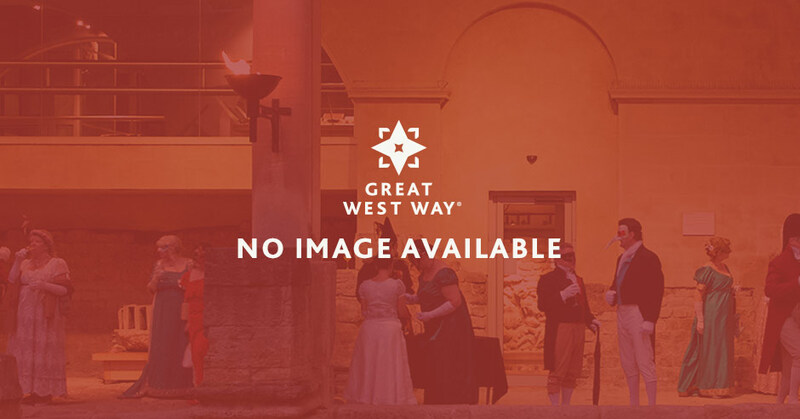 Luckily the Great West Way caters to the desires of all travellers, with its mix of quirky glamping sites, pretty countryside B&Bs, cool city hotels and even fancy castles and stately homes fit for kings, queens and American actresses turned duchesses. Or perhaps only a cosy room in a cottage will do? You’ll find plenty of homely B&Bs along the Great West Way where the flowers have been picked fresh from the garden, the patchwork pillows hand-plumped by your characterful host and the breakfast (full English, naturally) has been lovingly prepared using eggs from the host’s own chickens. Trend-following travellers will be equally excited by all the design-led boutique hotels and guesthouses, in rural as well as urban areas. Many seek their inspiration in local art, culture and landscape so they remain rooted in their location, as well as looking fabulous on Instagram. Ideal for the curious and the culture-obsessed (dare we say hipster? ), these places have cutting-edge art on the walls, artisan-upholstered chairs, enchanting spa experiences and cosmopolitan cafés. A flat white and smashed avo on toast is the breakfast à la mode. For those who require champagne on arrival and dainty afternoon tea on the lawn (after a round of croquet, of course) there are some truly exceptional heritage hotels along the route, where tradition ensures every tiny detail has been considered to make your stay marvelous. Think elegant old mansions transformed into hotels, walled gardens, panoramic views, antique furniture, luxuriously-scented toiletries and fine dining. And yes - do go ahead and call yourselves Lord and Lady of the Manor, it’s only fitting. Take a look at the Great West Way’s many accommodation options here and book the perfect place for you. 17th century stone Manor House set in open countryside, within walking distance of Bradford on Avon and 8 miles from Bath. This family friendly hotel welcomes children and dogs and its Elemis spa, two heated pools and 14 acre gardens, offer a chance to truly relax in this English country house. High quality self-catering holiday homes in Bath and along the Western section of the Great West Way. Quaint country cottages to elegant Georgian townhouses. Properties sleeping from 2 to over 20 guests. Central booking office. Standing in over 30 acres of peaceful, secluded grounds on the edge of the Cotswolds, Cricklade House Hotel offers a traditional, warm and friendly welcome for those in search of tranquility, comfort, good food and wine, with extensive recreational facilities. The Roseate Reading was originally a share hall for the Berkshire County Council. The building along with its wide hallways, vaulted ceilings, cornice mouldings and the original lift shaft have all been restored to their original glory. The Bruce Branch of the Kennet and Avon Canal Trust offers canal holidays to disabled, disadvantaged or older people – along with their family, friends or carers. Our wheel-chair-accessible boats are based at Great Bedwyn, near Hungerford. Discover the incredibly bold and stylish sophistication of the closest hotel accommodation to the mystical Stonehenge with free parking and free WIFI in the lounge. Located on the A303 in the heart of picturesque Wiltshire. Five miles from the M4 between Bath and Swindon, this 400 year old coaching inn has been extended to include a gym, indoor pool, courtyard garden, bedroom wing and stylish new brassiere, bar and lounge, the hotel has car parking onsite. Apex City of Bath Hotel is just 200m from Bath Thermae Spa. You’ll find stylish bed rooms and large conference facilities. Hotel, wedding venue and golf course in Newbury, Berkshire. Donnington Grove Hotel is a stunning country house hotel nestled in the tranquil countryside near Newbury. Set in 500 acres of gorgeous countryside, the hotel boasts unrivalled views of Donnington Castle, the beautiful River Lambourn and all the wildlife it calls home. Our beautiful home is in the heritage quarter of Calne. It is easy driving distance for Avebury, Stonehenge, Bath etc. You’ll love Heritage because it is a beautifully renovated Victorian Gothic house, and the ambiance is warm and welcoming. Our B & B is excellent for couples, solo guests, and business travellers. Sitting in a former royal hunting ground and with landscaping originally designed by England’s greatest gardener, Lancelot ‘Capability’ Brown, the setting of this grand country manor amidst acres of formal gardens and parklands, offers an escape where time slows and natural beauty bounds. The hotel’s boutique selection of 41 exquisite rooms and suites are to be designed by Dennis Irvine Studio with the height of sophistication and refinement in mind. The rooms are divided across the main house and The Brew House, a Grade II listed 18th century outbuilding. The Langley Spa, a world-class wellness centre will feature an indoor and outdoor pool, thermal area and five expansive treatment rooms. Four brand new self-catering lodges with hot tubs set on a peaceful location overlooking Devizes Marina. An ideal base for visiting the Kennet & Avon Canal, Avebury Stone Circle and Bowood House and Gardens. Two lodges are pet friendly. A majestic mansion boasting fine dining and a contemporary spa, set among seven acres of beautiful landscaped gardens. Friendly canal narrowboat holidays in the heart of Wiltshire. Our prices include fuel, gas, 3GB wifi, parking, sheets and towels. Enjoy breakfast or a light lunch at our canalside café on site in the lovely village of Honeystreet.